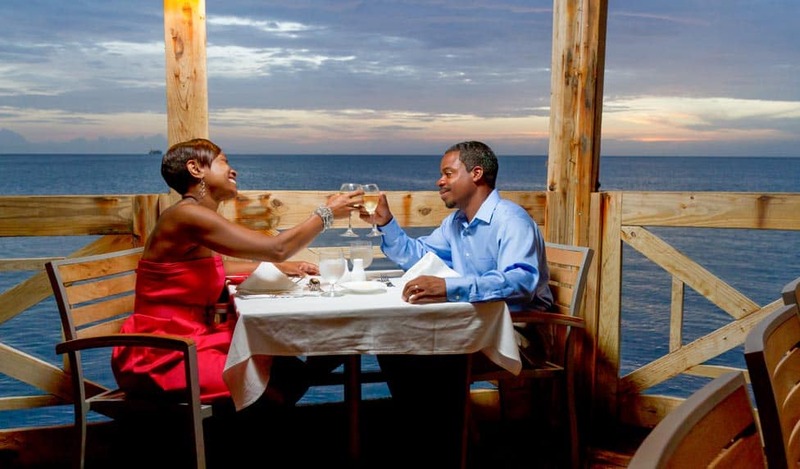 From casual beachfront snacks to fine French Creole dining, our restaurants offer a bounty of incredible cuisine with something for everyone. In all a la carte restaurants the maximum table size is 8 persons, however tables for larger parties can be arranged at 9:00pm and 9:30pm daily. Larger tables are always available in the Palms buffet restaurant. 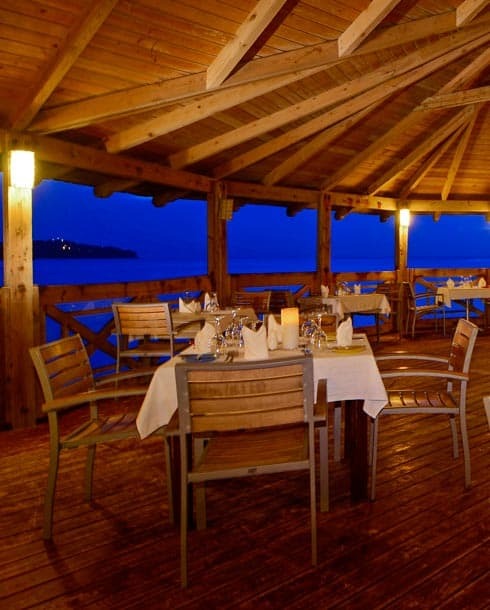 Dinner reservations are required in all a la carte restaurants and are made upon arrival to the resort. The dinner reservations desk is located in the Lobby and is open daily from 8:00am-3:00pm. 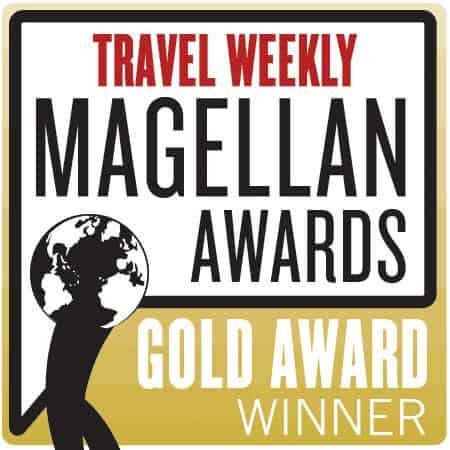 St. James’s Club Morgan Bay is a refreshingly informal resort, in line with today’s casual, yet sophisticated travelers. For breakfast and lunch, cool and casual resort attire is welcomed at all restaurants and bars. Bathing suits must be covered and dry and footwear worn. In the evening, fashionable island attire including dresses, trousers or tailored shorts, and collared shirts are perfect (no cutoffs, short-shorts, or t-shirts please) as well as appropriate footwear (no beach flip flops please). Dinners at Le Jardin are a bit more upscale, requiring dresses, long pants, collared shirts and dress footwear. Fashionable jeans are perfect for all restaurants. Please note that all restaurant operating hours are subject to change. The Palms serves up a bountiful buffet of flavors. 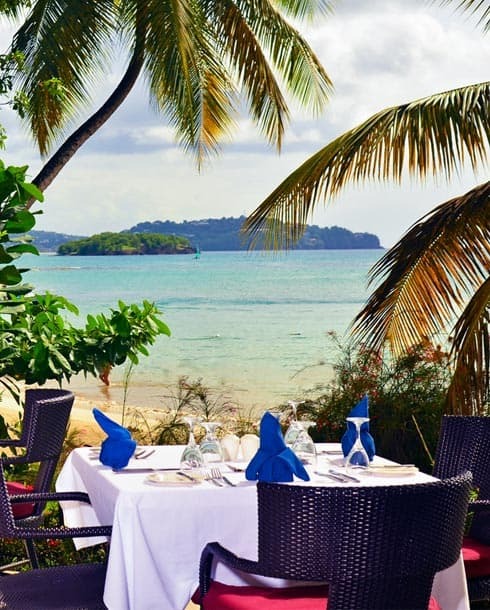 Bambou is our Caribbean fusion al fresco beachfront restaurant. Enjoy amazing views and fresh seafood at Morgan's Pier. Le Jardin offers romantic upscale dining in air-conditioned comfort. 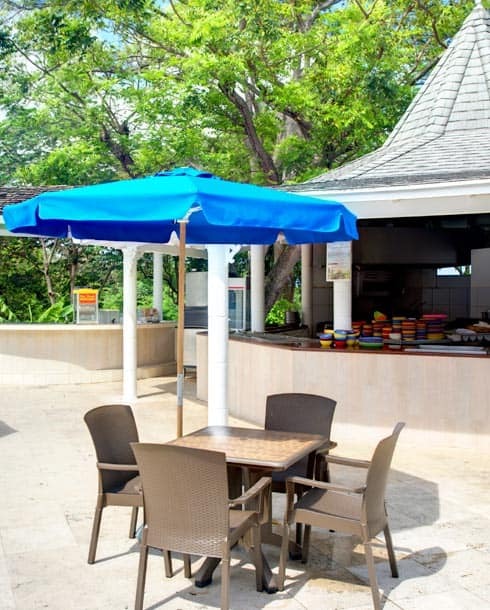 Grab a quick bite to eat at this breezy grille located next to the family pool. Tree Tops Pizza & Pasta offers made to order pizza and creative pasta dishes. Situated on the beach, by Morgan Piers, you can indulge daily in our homemade burgers and hot dogs, our Beef Brisket Smoked Sandwich (A house specialty) with BBQ Ribs and BBG Fish and Chicken, and choice of fresh daily salads, this hangout give your taste buds a delicious alterative to dining in the restaurant for lunch, open daily from 11.00am to 4.00pm (weather permitting), right on the beach, with bench tables or take your food back to your sun lounger, and there is always a cold rum punch to way it down with. 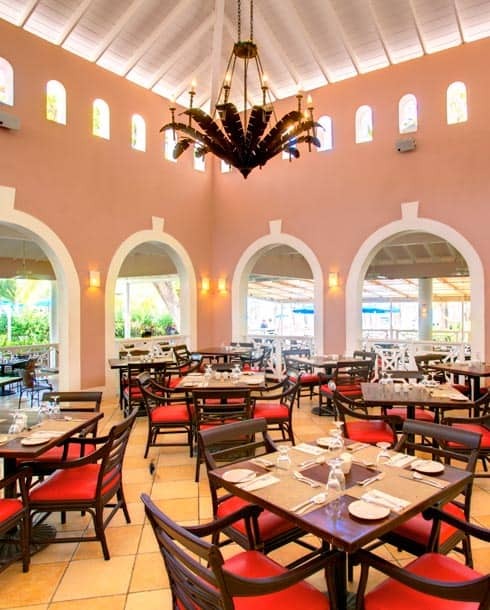 With classic Caribbean architecture and a beautiful tropical garden setting, the Palms Restaurant serves up a bountiful buffet with flavors from around the world. Open daily for breakfast, lunch, and dinner. Full bar service including beer, wine, cocktails, and blended drinks. Dinner service begins at 6:30pm, with the last seating at 9:00pm. Lunch service is from 12:30pm to 2:30pm. Breakfast is served from 7:30am to 10:00am. Bambou is an al fresco beachfront restaurant with modern Caribbean décor, located just steps away from our gorgeous beach. 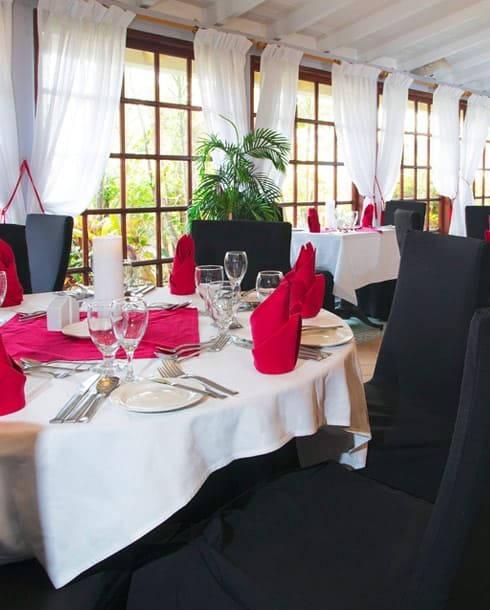 Offering a light & causal menu for lunch, and Asian Fusion and Contemporary Caribbean Cuisine for evening fare. Open daily for breakfast and dinner, and some days for lunch. Full bar service including beer, wine, cocktails, and blended drinks. Dinner service begins at 6:30pm, with the last seating at 9:00pm. When available, lunch service is from 12:00pm to 2:00pm. Breakfast is served from 7:30am to 10:00am. Step out over the water and back in time at Morgan’s Pier Restaurant. The open-kitchen concept of Morgan’s Pier allows you to take in the majesty of the Caribbean while you enjoy an incredible selection of local cuisine. Enjoy fresh seafood and grilled classics with amazing views of the Caribbean Sea while watching sailboats glide across the horizon. Open most days for dinner. Full bar service including beer, wine, cocktails, and blended drinks. Dinner service begins at 6:30pm, with the last seating at 9:00pm. 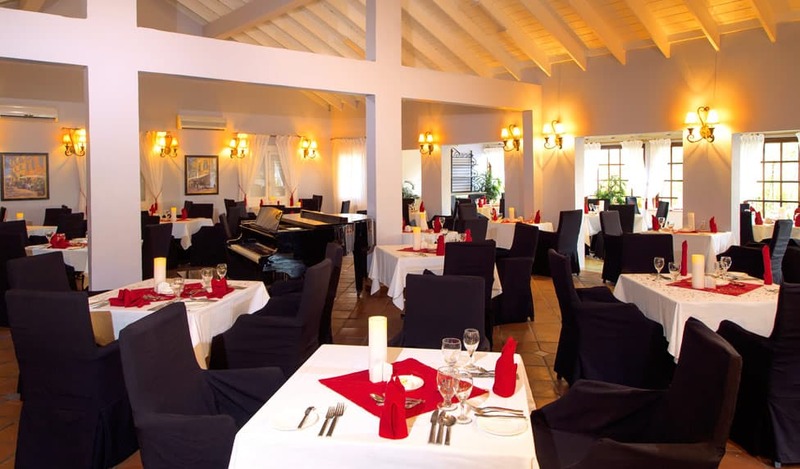 Our fine dining bistro Le Jardin offers romantic upscale dining in air-conditioned comfort. 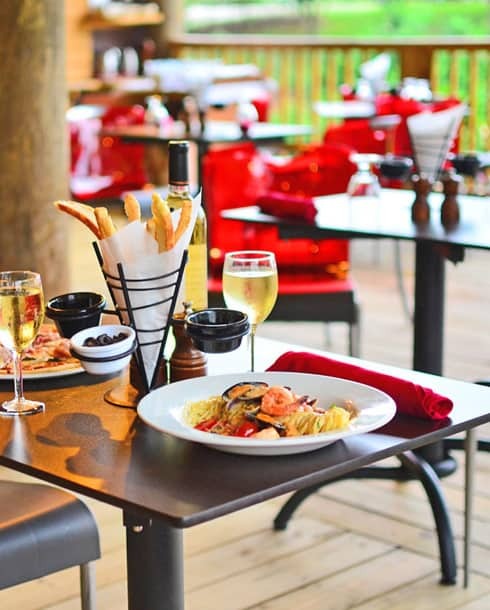 From French Creole cuisine to savory steaks & seafood, Le Jardin is perfect for an intimate evening, complemented with fine wine, silky desserts, graceful piano accompaniment, and elegant service. Le Jardin is open for dinner, for guests 12 years and older. A surcharge of $35 per person applies for each time you dine at Le Jardin, allowing us to provide you with first-class service and a sophisticated menu while maintaining our very attractive All-Inclusive nightly rates. Dinner service begins at 6:30pm, with the last seating at 9:00pm. 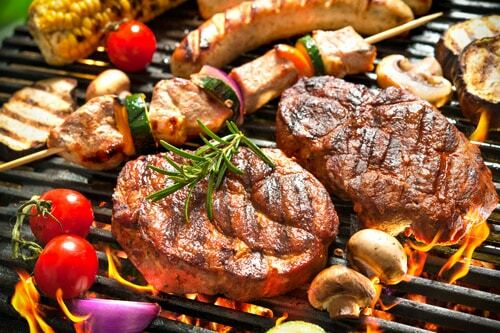 Located on the family pool deck adjacent to the tennis courts, and offering up delicious lighter fare, grilled items, snacks, and all of your favorite drinks. Open daily from 11:00am to 7:00pm, with the last order taken at 6:30pm. Tree Tops Pizza & Pasta is our newest eatery, offering made-to-order pizza and creative pasta dishes. Our latest restaurant addition is a popular dining spot, putting a fun spin on classic Italian favorites. Try the Knickerbocker Glory sundae for dessert! Open from 6:00 pm each evening, with the last order being taken at 9:00 pm.